Hooray! Summer is "officially" upon us! The beaches had record numbers of people this past Memorial Day weekend. The tuna had cesium from Fukushima. San Onofre is still shut down. The lights are still on. But what happens next? The utility doesn't seem to be doing much of anything to prevent "rolling blackouts" in the San Diego area this summer, except quietly pressuring -- or shall we say strong-arming? -- the California Public Utilities Commission (CPUC), the California Energy Commission (CEC), the California Coastal Commission (CCC), key members of the legislature, and the governor's office to let the utilities CONTINUE to do nothing. They've been very successful at it. Together, they have about a billion dollars in ratepayer-provided funding for solar projects in California, which is being held up (pun intended) because the funding isn't being distributed. Add to that, more than a thousand small (and not so small) renewable energy projects which have been built and are in use, but are not allowed to "hook up' to the grid to provide additional energy to the system, because the utility hasn't come out and approved and completed the hook-up! Some have been waiting for YEARS! The people are being robbed of the opportunity to supply hundreds or even thousands of megawatts to our grid, and cut thousands more in energy use. Because the utilities want to keep there dirty, dangerous nukes. Each state agency that is charged in some way with protecting the public welfare from something that might harm us at San Onofre -- even if it's only excessive rates -- is NOT allowed to regulate on anything having to do with "safety" at the nuclear power plants. That's solely the regulatory jurisdiction of the Nuclear Regulatory Commission (NRC), who's head, Gregory Jaczko, just resigned after visiting San Onofre -- and some of the local activists who oppose it -- last month. Southern California Edison (SCE), San Diego Gas and Electric (SDG&E), and Pacific Gas and Electric (PG&E) are among the largest, oldest, and most powerful corporate monopolies in the state. Each is a larger financial entity than many countries. All have enormous control of the aforementioned state agencies and many other aspects of state, county, and local government. Their ex-CEOs and presidents even serve on the commissions sometimes. The utilities can force anyone out they don't like, but they hardly ever have to, since they can block anyone from being on the commissions that they don't like in the first place. The utilities don't need to push the federal Nuclear Regulatory Commission (NRC) at all -- it will bend over backwards to do whatever the utilities need, since the utilities provide 90% of the funding that pays their salaries. Close a nuke: Put dozens of NRC regulators out of work. There is an average of about 40 NRC employees per reactor (2 on site). So, barely regulated, San Onofre sits quietly on the beach right now doing little more than gathering bird poop. We don't want radioactive releases here -- planned or unplanned! We don't want Fukushima's poisons in our tuna, even if the levels are "only" 3% of the total background radiation. And Fukushima's not only still spewing, it's probably going to still be spewing long-lived (and short-lived) radioactive poisons for decades to come! Fukushima woke a lot of people up. That's one reason so many workers at San Onofre have to be brought in from outside the area. Those that have "drunk the Kool-Aid" go all around the country, from reactor to reactor, making obscene salaries. Many other plant workers are one-shot, temporary "jumpers" who, for the cumulative risk of a couple of chest x-rays (including a couple of REAL chest x-rays to make sure their cigarettes haven't already started to kill them, since many of these "jumpers" smoke) they'll make thousands of dollars for a few hours of "interesting" work inside the reactor, and a couple of weeks of training beforehand. Nice work if you can get it? Something's got to kill you anyway, right? The car ride on I-5 to and from the power plant is probably more dangerous, they reason, and they might even be right -- unless there's Fukushima-type accident here. San Onofre's operators say they won't let that happen. But note two things. First of all, as any nine-year-old can tell you (and some have...): Fukushima's highly-paid "experts" said the same thing (with dozens of American "experts" on staff at all times at the site, and dozens more in consultation around the world. None of them knew what to do. Nobody did.). And second of all, they don't really say that. They used to say that. And they still say, "they have family here and wouldn't let them live here if they didn't think it was safe." But in fact, when asked hard questions by people demanding answers, such as mayors of local towns they say: "mitigation" now. Mitigation is NOT prevention! I don't want "mitigation"! I want prevention! They never used to talk about things like "mitigation" (I've been attending nuclear hearings for decades). They would stop the conversation with "well, we're not going to let that happen." Now, after Fukushima, they admit it might, but feel they will "mitigate" the consequences. One example of "mitigation" is "shelter in place". This refers to expecting residents who are caught downwind of a nuclear disaster at a nuclear power plant to duct tape their doors and windows (and chimney flues, bathroom fan vents, cracks in floors, walls, and ceilings, etc.). But of course, they know you can't really do a very good job of it and if you did, you'd run out of air long before the radiation levels outside had dropped to "tolerable" amounts. Long before the "hot particles" had dissipated somewhere else. Here, in our tuna, for instance. A lot of people want San Onofre closed permanently, and many more voices are being added to the call for shutdown each week. And it's not just "environmentalists" or "greens" this time. San Onofre, we've learned from Fukushima, is bad for business. It's not a Republican or a Democratic issue. It's only connection to Communism is that they do it too -- only worse. It's not a political question at all. It's a question of survival, and businesses like to survive, too, just like people do. San Onofre must be completely dismantled so that it can never run again. They drilled holes in the Huntington Beach (gas fired) boilers specifically to prevent them from operating ever again. Now they are repairing and restarting that power plant and upgrading/building several others (Carlsbad and Santee, for example), all on the flimsy excuse that San Onofre will be down for the summer. Most likely San Onofre will be down a lot longer than that, until new steam generators are built, tested, installed, and tested again ... unless the NRC let's them run at reduced power/pressure, and increase power and pressure bit by bit until something blows again. Of course, it's always possible that the lame-duck, lap-dog NRC will hold its ground and refuse to let SCE restart SanO, a dubious thing to hope for, even if it's been happening so far. The operators might keep the plant closed or running at half power (or more... or less...) for a couple of years while Mitsubishi Heavy Industries works 24/7 to build NEW steam generators to the OLD design except with the "new" Inconel 690, which is an industry-wide replacement for Inconel 600. Inconel 690 is also used in the aviation industry, aerospace, and several other specialty industries. But Inconel 690 also embrittles, and steam generator tubes leak on a regular basis. That's presumably why SCE tried to add hundreds of extra tubes in the first place. Spare parts, as it were. According to the record, San Onofre didn't even check the tubes for wear the first time they shut down after replacing all four steam generators (two per reactor) despite having introduced dozens of design changes -- and slipping those design changes under the NRC's nose by calling it a "like for like" replacement! When they shut down the first unit, SCE didn't even check to see if anything was amiss in their new reactors (or at least so they say). Instead, the other reactor sprung a leak: A burst of radioactive water flashed to steam as it flowed from the ~2200 PSI primary loop into the ~1200 PSI secondary loop. Then the steam was condensed and the radioactive noble gases escaped into the building, and set off alarms. The pressure in the primary loop dropped a little as a couple of gallons an hour was being lost. The rate of loss was increasing when they shut the reactor down, about a couple of hours after realizing they had a problem. The author has been watching the nuclear industry meltdown for approximately 40 years. He is the author of The Code Killers, a handbook of nuclear information available for free download or viewing online at his web site: www.acehoffman.org . Rolling blackouts? Says who? Restart SanO? SAYS WHO? Today has been historic for California! In Washington, at the Nuclear Regulatory Commission (NRC) Headquarters, Chairman Gregory Jaczko stated not only that the NRC isn't about to allow San Onofre Nuclear (Waste) Generating Station to restart any time soon -- but in addition, he added that they haven't even been given the documentation from Southern California Edison (SCE) about what went wrong with the steam generators, which they'll want to "thoroughly" review first! Not only has SCE been saying they've been supplying the NRC with all the information available, they BOTH have been saying the NRC has had people on site and involved the whole time. SCE has claimed to have specialists from Mitsubishi Heavy Industries (MHI made the faulty steam generators) and independent "experts" from all over the world looking into the problem. But in more than three months, not one "expert" has come forward to talk professionally about what they've found. The public has been left completely in the dark, and it appears that the NRC has been, too. And I'd be willing to bet those "independent experts" aren't so independent, either! The fact is, we don't need San Onofre. Nobody in charge of electricity usage in California wants to actually say it, perhaps because traditionally, doing so is a "career-killer", but we don't need San Onofre. Why bother? That money could be used to build solar rooftops, or offshore wind turbines. We don't know how to safely store the waste San Onofre generates. We can get the electricity it generates in far cleaner ways, so let's do that instead. Let's send San Onofre to the scrap heap. No, wait a moment on that. You can't just "scrap" it, you can't recycle its metals. They have become radioactive. In fact, there's no place on earth to put it! No place under the earth, no place under the sea.... no way to get it into space because you can't be sure it won't hit some piece of space debris on the way up, and/or have a rocket failure and fall back to earth in the worst possible way -- vaporized in a burning reentry!!! But you CAN keep San Onofre turned off, which is a great idea since whenever you run each reactor, you create, in one day, about 250 pounds of deadly poisonous "spent fuel", including more than a pound of plutonium, which is about 200,000 times more deadly than the uranium atom it came from! That one pound of plutonium is enough poison to kill about a billion people if it were to get out of the reactor and into the people -- thank goodness for dilution, but prevention is better! Don't make it in the first place. About every 10 days, each reactor creates enough plutonium for a nuclear bomb. Sure, it has to be "processed" before you can use it as a bomb, but you've made the material. It never existed before. For a bit of electricity which is easily obtained safer ways, you also created a whole lot of other poisons -- poisons which CANNOT be created any other way except in a nuclear reactor! Poisons which cannot be safely contained, because they can destroy any container you put them in (it's the definition of "ionizing radiation" that it has the energy to do this). Poisons which cannot be safely transported, because they're flammable, vaporizable, targetable, and very difficult to handle since you can't get near "spent fuel" without tons and tons of special shielding. Poisons that are very difficult indeed to isolate from humans, but which must be, safely and affordably, for hundreds of thousands of years. It can't be done. Radioactive elements are lethal in quantities of mere millionths of a gram. One byproduct, tritium (3H), is so deadly that a normally operating reactor can only release a fraction of a teaspoon in a whole year. (And they do.) That amount has to be diluted in billions of gallons of water to be below legal limits for "safe" drinking water. The radiation levels INSIDE the broken reactors in Japan would kill a person in seconds, so no one can go in there to clean up the mess, and stop the ongoing meltdowns. Robots can't last in that lethal environment either. There are no "experts" who know what to do there! By restarting San Onofre, we are making an unsolvable problem worse. But it turns out there's no need to run the reactors anymore. No need to fix them. No need to risk Fukushima in Southern California. So why not shut San Onofre forever? Then it won't be nearly as risky in the event of an earthquake (the longer the fuel is out of the reactor, the safer it becomes). And then it can't poison San Diego and Orange counties for thousands of years nearly as easily. Today, Nuclear Regulatory Commission Chairman Gregory Jaczko stated, regarding San Onofre Nuclear (Waste) Generating Station, that: "Any discussion of the restart of Unit 2 or Unit 3 is clearly premature." This announcement was made apparently because of "erroneous reports in the media". At the very end of the hearing in Sacramento, some direct questions about contingencies for rolling blackouts were discussed. Of course they have contingencies. Of course it could happen -- with or without San Onofre operating. Don't be surprised if there are rolling blackouts if attention isn't paid to the need to conserve energy. If extraordinarily hot days occur. If wildfires down power lines. But at least there won't be blackouts AND EVACUATIONS due to meltdowns! Those testifying in Sacramento today had four or five different reasons that SoCal can live without SanO. We have backup power generation, we have transmission lines, we have conservation plans, we have incentives for businesses to conserve energy... and we have a lot of excess capacity, too. These were not "anti-nuclear" activists talking, these were system operators of our power grid. They actually hoped San Onofre would come back online! But they could not and did not say we need it. Keep San Onofre closed forever! Write to the NRC, the CPUC, the CEC, and the ISO to demand San Onofre be taken out of our energy mix FOREVER -- and Diablo Canyon, too! The author has been studying energy issues in California for many decades, and nuclear energy in particular for more than 40 years. 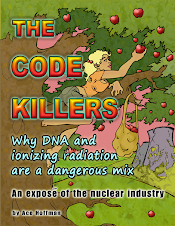 His 2008 book on nuclear issues, The Code Killers, is available for free download from his web site: www.acehoffman.org . Hoffman, 55, is also a computer programmer and cancer survivor. He resides in Carlsbad, California. Ever since Fukushima, the world has been waking up. Slowly. Last Sunday various local groups held a rally to keep San Onofre shut down forever. It's been shut down for more than three months already due to parts failures, and the utility company NOW wants to restart it at as little as half power, because it's too dangerous to run at full power. This is ridiculous! Clearly, they plan to raise the temperature, pressure, and/or flow rate until something vibrates, bursts, or there is a cascading and catastrophic failure of the steam generators -- and then, if it's not the last one, back things off a bit, fix things up, and start again! They presumably plan to start running at a lowered pressure, and inspect it after a few months and see how well it survived.... Then do the same thing at a somewhat higher pressure for the next cycle.... Until they get scared to go any higher. Not until I get scared or you get scared. They want to decide. Despite all their failures so far, they still want complete control with NO public oversight! If they restart, they'll be taking our lives into their hands with the money they pocket. And you can be sure they'll pocket a profit even at 50% power... because they don't have to pay the full expenses of storing used reactor cores, of accidents, of research and development... or even of fixing broken parts, because they bill THAT to the ratepayers! Thank you, California Public Utilities Corporation (CPUC)! Err, I mean Commission, but who's on that commission? Thanks to everyone who appeared (and didn't appear, but was there)!! Today I was interviewed by Brandi Powell, News 7 San Diego, which will presumably appear on their station this evening, and on their web site as well. I was emphatic that the plant should never reopen, and that cranking up the power and seeing what fails is no way to run a reactor! We expect to have another rally soon. Please join us!